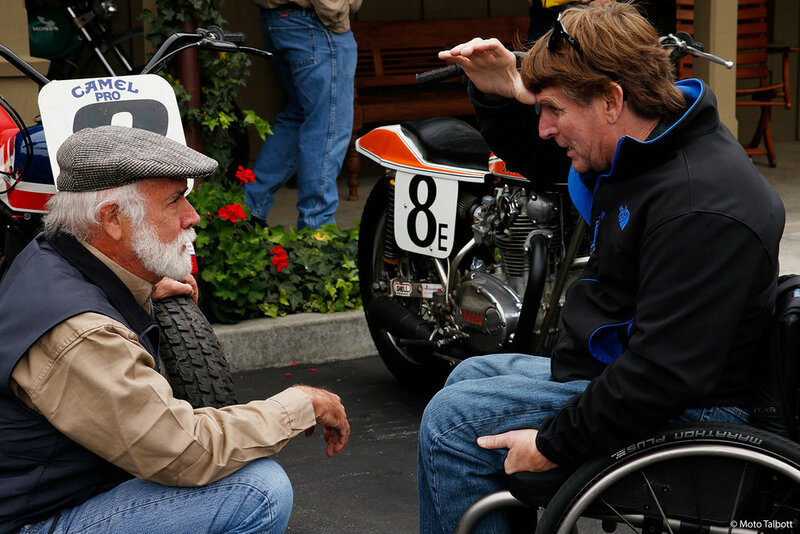 We were honored and amazed to have three-time world champion and local legend Wayne Rainey show up at our Vintage Flat Track event on March 18. Rainey was part of a tradition of riders with flat track experience who would go on to spectacular careers in road racing, including his friend Eddie Lawson, Kenny Roberts, Doug Chandler, and Bubba Shobert, among others. His friend Gordon McCall, who runs the famed Quail Motorcycle Gathering, brought a freshly restored Yamaha to the event that was originally built by Rainey’s tuner, Shell Thuet. We chatted with Rainey about the bike and his views on flat track racing back then, and today. Why is this bike significant? Rainey: From what I’m told, this was the last bike that Shell Thuet built. [AMA Hall-of-Famer Thuet died in 2011 at age 98.] Before he passed away, I told Shell I was looking for some of my dirt track stuff if he had anything at his shop because I couldn’t find anything. He said he had one bike. This was it. When he sent it to me, I told him I wanted to display it. But when it showed up at my house back in ‘94, I went to start it. It looked just like this but didn’t have a crankshaft. I said, “Shell, how am I going to start this thing up?” He said, “I didn’t know you wanted to ride it!” So I gave him the engine back, he put a crank in it, and it runs now. I’ve heard it run. Gordon McCall had been keeping it at his place. He got it all fixed up and looking like it does now. Gordon actually told me about the event today. I was in town, and thought it would be great to see a lot of the dirt track bikes that I raced with growing up. I think it’s a pretty great event! What did dirt track mean to you and your career? Rainey: I grew up dirt tracking. I did that for 11 years. Then I had the opportunity to try road racing, and I could see I could probably make a career out of it, so I went that direction. But it’s always good to come back and see what led me down that path. Gordon McCall, founder of the Quail Motorcycle Gathering and a friend of Rainey's, helped prep the Shell Thuet bike for display. Did dirt track racing give you special skills that helped you succeed in road racing? Rainey: I think with the bikes at that time—the two-stroke 500s—for sure you had to have this kind of background to be successful. The way the tire technology was back in the day, you had to have a special feel for the bike. As history shows, you had to have a background in dirt tracking. What’s the state of dirt track riding today? Rainey: I think it’s still relevant. Racing and riding dirt track is good for bike feel—you’re racing close, and the track is always changing. So as a racer, it teaches you to work on your finesse. It’s still as relevant today as it was back then. Rainey and Moto Talbott museum founder Robb Talbott.